Growing up on the East Coast, I've always associated summer with seafood. However, don't let me confuse you into thinking that I've always liked seafood, because I haven't. When the Little Mermaid was introduced into my life, seafood dishes didn't stand a chance. In fact, I was so obsessed with that movie that I avoided eating all sea life until about the age of 16 (Oh, you mean you don't base your diet of your favorite Disney movie?! It's all the rage! #dietbydisney). Except for the forced pieces of fish on Fridays during Lent, I was only about creatures of the land. Then someone (read my Mom) forced me into trying shrimp cocktail...and I kind of liked it. Eventually I began to drift away from the mermaid days and into the land of adult tastebuds where I found that fish wasn't all so, well, fishy, crab cakes weren't so crabby, and lobster rolls were actually kind of amazing. I'm still picky about my seafood- I don't really get cravings for it, I only eat calamari and clams fried, I'm not a fan of oysters or salmon, and I refuse to eat seafood unless I'm by the coast and I know it's fresh (sorry Midwest). So you're probably wondering why the heck I even bothered to do a seafood boil? Well, in case you missed it up there seafood and summer go hand-in-hand, especially when you live on the coast. 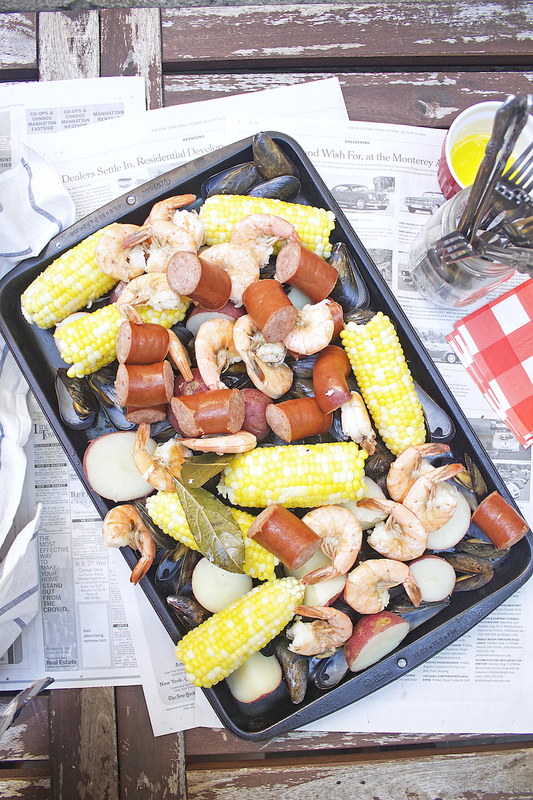 Secondly, a seafood boil can be completely customized to fit your (sometimes picky) seafood needs. Last but not least, I love a burger as much as the next girl, but sometimes, it's just fun to switch things up when it comes to summer entertaining. Dress//Since I've now mentioned several times how seafood and summers and living by the sea all go together, it would make sense to wear something nautical (read stripes). However......I decided to go with plaid. I know. Me not wearing stripes is basically the equivalent of Saint Laurent without the Yves. It's weird. Let's move on. 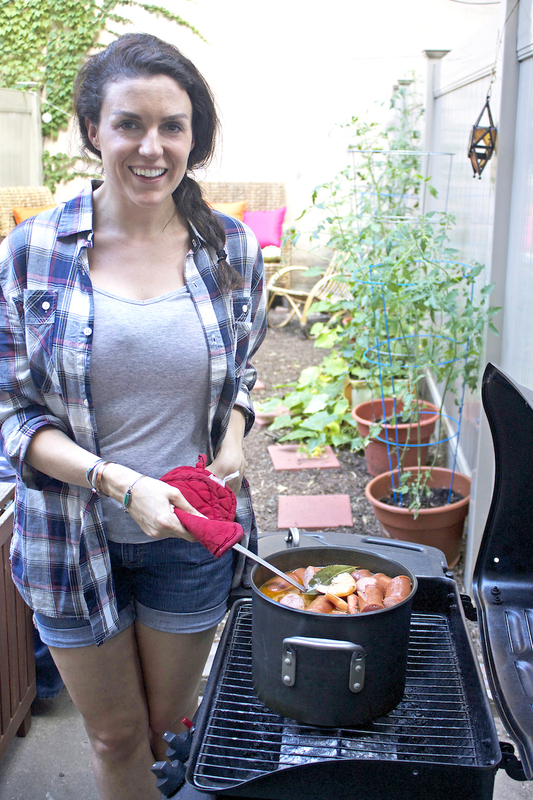 So obviously, the outfit is super caj, because it's summer and it's a weekend and you're cooking over a fire (or grill) and basically ain't nobody got time to be all fancy pants. So an over-sized plaid shirt (borrowed from the Mr.), jean shorts, and booties it is. Obviously, the options are endless. 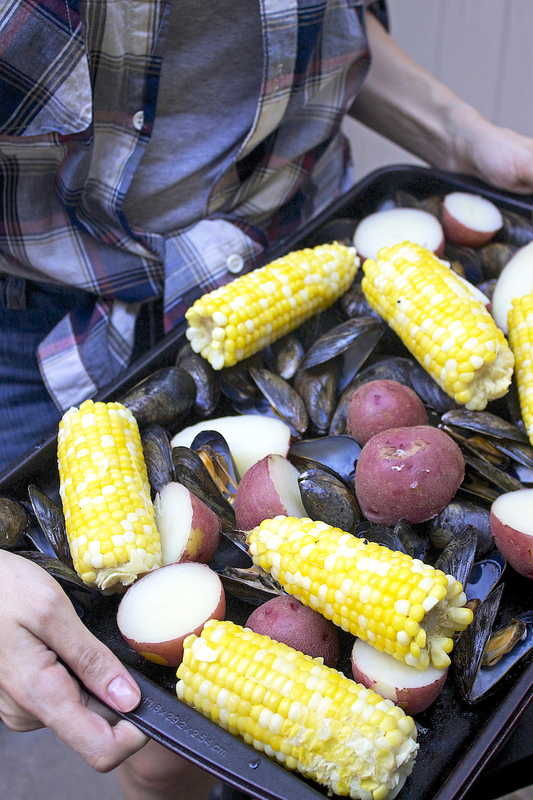 As far as serving the seafood boil, I recommend keeping everything else easy and rustic. 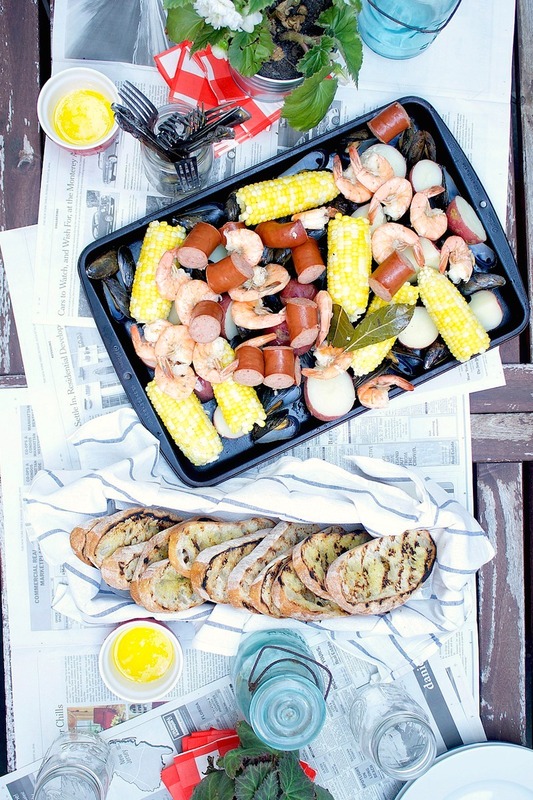 Cover the table with old newspaper, have some fun napkins, put silverwear in a mason jar, add a few plants (for daytime) or candles (for nighttime), and then serve the seafood on a baking sheet. Because the seafood is filling (especially if you add in the corn and potatoes) I simply recommend having a crusty bread on the side (we sliced ours, then brushed it with olive oil and grilled it for a few minutes), as well as drawn butter (for the veggies and mussels), and for drinks, craft beers complete the meal nicely. Add 8 cups of water, Old Bay seasoning, salt, pepper, sugar, bay leaves, beer and lemon juice to a very large pot and bring to a boil (on the stove, over a fire or on a grill). Add potatoes and corn and let sit in boiling water for 10 minutes. After 10 minutes, add in the mussels and kielbasa and let pot cook for 3 minutes. Once the 3 minutes has surpassed, add in the shrimp and let the pot cook for another 7 minutes. Periodically check the shrimp during this time. If the shrimp have a rosy-pink color they are done and you can take the pot off the heat. Let the pot sit for approximately 5-7 minutes, this will allow all of the flavors to mold and come together. 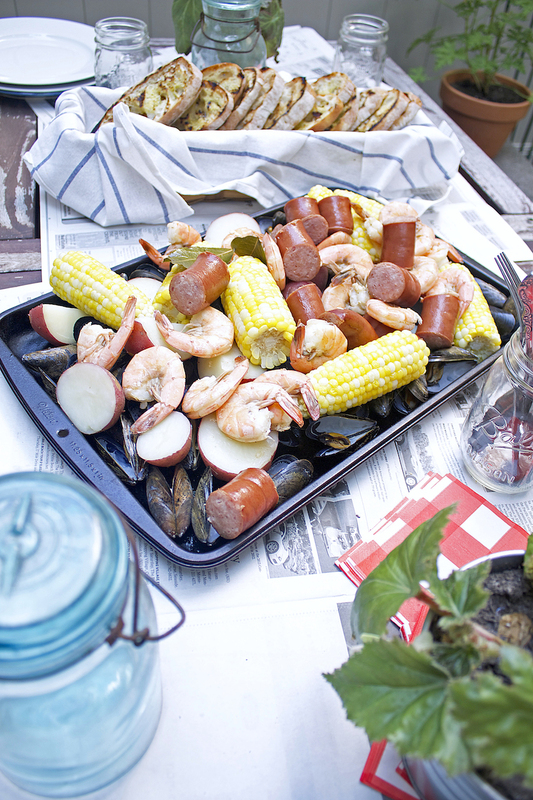 Once the pot has sat, take out corn and potatoes and place on tray, followed by the kielbasa, mussels and shrimp. Serve immediately. Store leftovers in a tightly covered container for up to 2 days. Amounts can easily be cut in half, doubled, tripled, etc to make this more appropriate for a smaller or larger group of people.